WINNER! 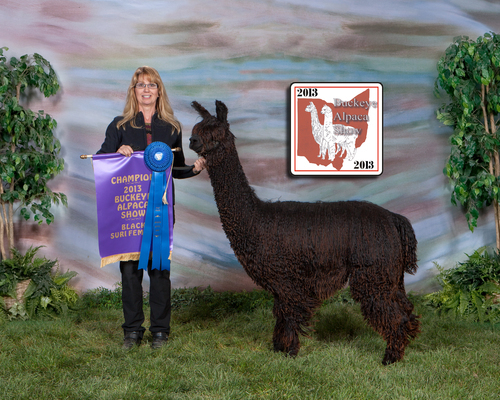 - 2015 Suri Network All Suri Fleece Show - "The Spirit of the Fiber Industry Award"
$4,000 Your next herd sire! We are thrilled with Mannix! 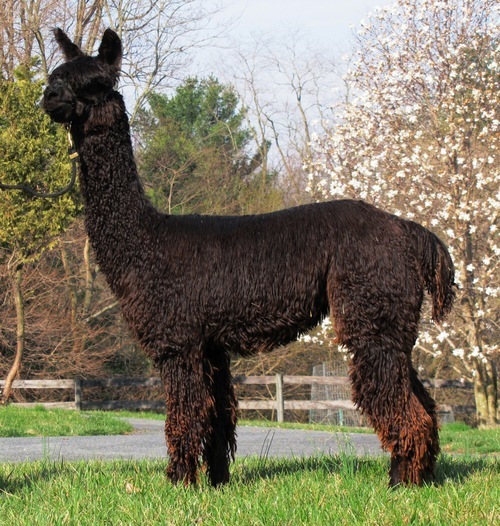 What a macho male he is with a wonderful friendly personality, beautiful fleece, and comes from lines of multiple champions, including Accoyo Allegiance, Avanti, MacGyver's Balboa, and many champions from Park View Alpacas. Mannix has beautiful slick, drapey fleece, luster like a shining light, and above average density. His dam, Black Swan, is the daughter of a long line of champions, and is herself a Champion. Black Swan is the daughter of MacGyver's Balboa, a true black who racked up 16 Championships in his show career. Black Swan's dam is the grey Silvana of PVA, a champion herself who has never placed lower than 2nd. Silvana's sire is Montoya of PVA, and her grand sire is Mahogany Prince of PVA, another multiple champion. 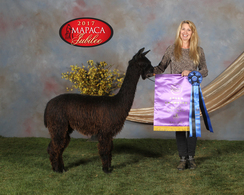 Mannix's sire is our own Judge's Choice winner in 2010, WRSR Accoyo Allegiance's Avanti, a light fawn male with notable and proven foundation Accoyo bloodlines of Bruxo, Baron, Maurizio, Kotzebue, and Starbuck. 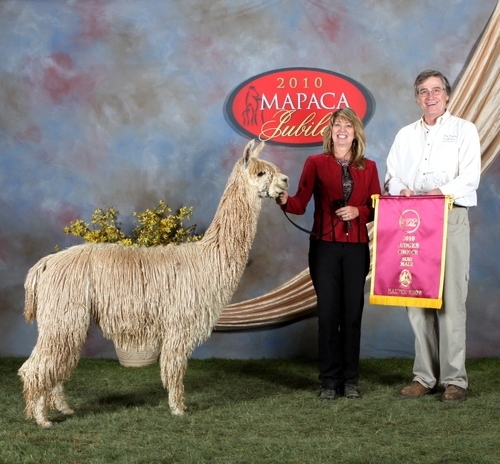 Avanti was selected for Judge's Choice at the 2010 MAPACA Jubilee for his fineness and uniformity exhibited even on his apron and belly fiber. Mannix''s grand dam, Fox Run's Peruvian Sakari, is a very fine white Accoyo Kotzebue daughter, who is holding her fineness even after 7 years of age. His grand sire, SL Accoyo Allegiance, was conceived at our farm from a full Accoyo female we sold, and repurchased when he was only 4 months old. Allegiance had gone on to win multiple fleece championships, and produced multi-champion offspring like Avanti. At only 9 months old, Mannix was awarded Black Color Champion at the 2017 MAPACA Jubilee Halter Show on April 23rd, 2017 against intense competition. 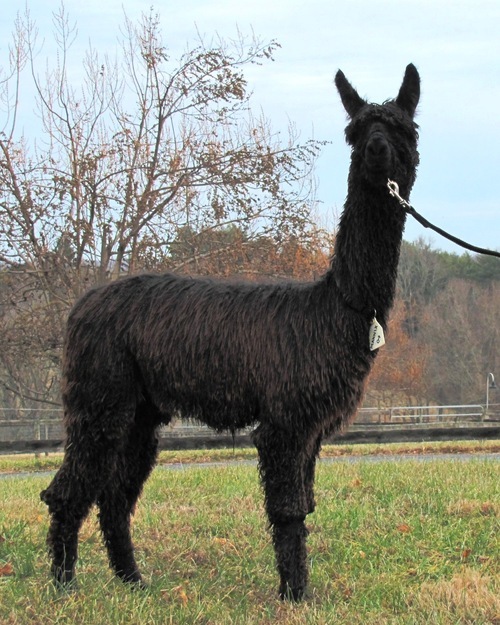 He holds a lot of promise and we are anxiously awaiting the regrowth of his shorn fleece so he can compete in the 2018 shows. Mannix's 2017 histogram yielded 20.4 AFD, 4.76 AFD, 23.31 CV, and a comfort factor of 96.99%. Contact Patti at 443-740-4240 for more information or to schedule a visit.